After returning home to Australia in 1975 from extended travels to Bali, Indonesia and Hawaii Phil and his brothers, Dave and Chris realised that they were all very addicted to the sport of surfing. Dave had won the Bells Beach junior contest, Chris the Australian junior and world junior title, and Phil was shaping for local manufacturers in Australia and again in Hawaii. Pro surfing was starting to develop, and as Dave was a surf board glasser they decided to set up their own surf board brand. This is how Byrne surf boards originated. Over the next few years they used the surf board company as the base for travelling and competing. The brothers would travel to Hawaii each year to compete and the knowledge they would gain would go back into their surfboards. 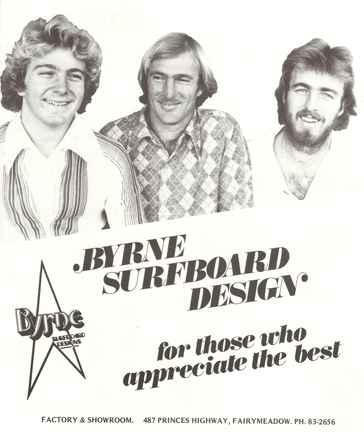 As a result Byrne Surfboards became world class, attracting many surfers at the time to use them. Shaun Tompson and Larry Bertleman to name a few. The surfboard company gave younger brother Chris the financial freedom to compete on the world circuit. After a time his results were very good averaging 7th on the world tour in his final year before a back injury ended his career. At the same time that Chris was enjoying his success on the circuit, a young surfer by the name of Tom Carroll developed a keen interest in Chris’s boards and after a few surfs, ordered some of his own. This was the starting point of the Tom Carroll/Byrne relationship. The history of this is well documented and Tom went on to win two world pro titles riding Phil Byrne shapes and to this day still rides Phil Byrne shaped boards. 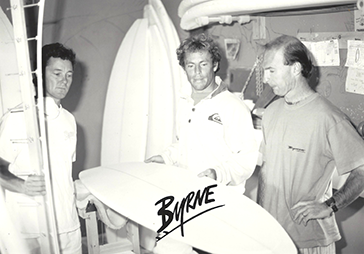 Because of Tom Carroll’s success and the notoriety of Phil Byrne’s shapes a world demand developed for Byrne Surfboards. Realising this demand other shapers around the world became interested in the Byrne image. At this present time Byrne surfboards are available in most surfing countries of the world. Other shapers including Michael Baron of the United States have contributed to the brands continued success. Throughout the last 25 years Byrne has maintained its status as a premier world surfboard label by a constant stream for exceptional surfers having great success on Byrne built equipment. These guys include surfers such as Rob Page, Marcus Brabant, Simon Law, Todd Prestage, Jeff Booth and more, most of who still choose to ride the boards today. Currently Byrne’s Department of Youth is perhaps the best junior team in the world. This team, spearheaded by Owen Wright (see our tem profile) is aiding in the continued refinement of Byrne surfboards and performance on the world stage. 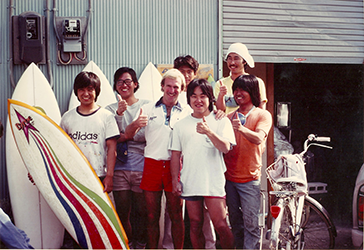 The other great feedback for Byrne surfboard development comes from the customers themselves. They come from all different styles of surfing and their feedback has helped shape such a great range of surfboards for all surfers needs not just the pro’s. 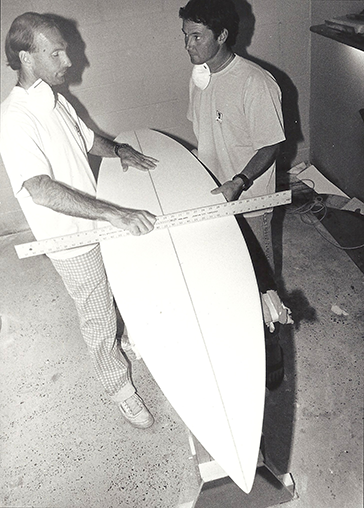 The Byrne philosophy is to continue to improve surfboard development through communicating with all our team and customers to help improve every surfer’s performance and enjoyment. The better you surf, the more fun you have.